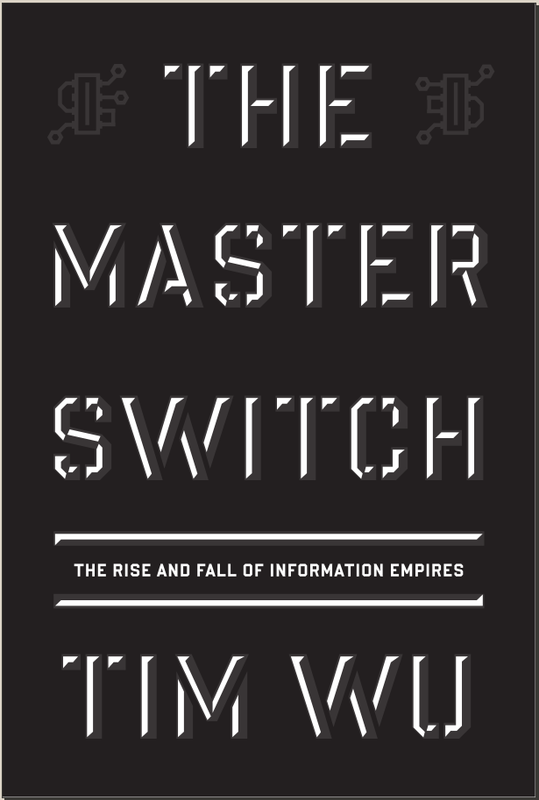 Tim Wu’s new book, The Master Switch: The Rise and Fall of Information Empires, will be released next week and it promises to make quite a splash in cyberlaw circles. It will almost certainly go down as one of the most important info-tech policy books of 2010 and will probably win the top slot in my next end-of-year list. Of course, that doesn’t mean I agree with everything in it. In fact, I disagree vehemently with Wu’s general worldview and recommendations, and even much of his retelling of the history of information sectors and policy. Nonetheless, for reasons I will discuss in this first of many critiques, the book’s impact will be significant because Wu is a rock star in this academic arena as well as a committed activist in his role as chair of the radical regulatory activist group, Free Press. Through his work at Free Press as well as the New America Foundation, Professor Wu is attempting to craft a plan of action to reshape the Internet and cyberspace. As I noted in my essay on “Two Schools of Internet Pessimism,” what I find most lamentable about the state of cyberlaw and high-tech policy debates today is the foreboding sense of gloom and doom that haunts so many narratives. To crack open most Net policy books these days is to step into a world of corporate conspiracies, nefarious industry schemers, closed systems, “kill switches,” squashed consumer rights, and so on. Let’s face it, Chicken Little doesn’t need an agent; pessimism sells. The world loves a good tale of villainy and misery, and that’s exactly what Columbia Law School professor Tim Wu delivers in his new book, The Master Switch: The Rise and Fall of Information Empires. Wu’s book is important if for no other reason than he is considered one of the intellectual godfathers of modern cyberlaw and The Master Switch is best understood as the final installment in an important trilogy that began with the publication of Lawrence Lessig’s seminal 1999 book, Code and Other Laws of Cyberspace and then was continued on in Jonathan Zittrain’s much-discussed 2008 book, The Future of the Internet & How to Stop It. To better understand where Wu wants to take us in The Master Switch, we must first return to the central tenant of Lessig’s Code: “Left to itself,” Lessig predicted, “cyberspace will become a perfect tool of control.” (pg 5-6) Code quickly became a sort of cyber-collectivist Bible and today Lessig’s many disciples in academia and a wide variety of public policy regulatory advocacy organizations continue to preach this gloomy gospel of impending digital doom and “perfect control.” Zittrain and Wu are Lessig’s most notable intellectual descendants; the Peter and Paul of the Church of Cyber-Doom that he founded. And despite their insistence that they really aren’t all that pessimistic—or, more humorously, that they are actually libertarians in disguise—this crew persists with frightful tales and lugubrious warnings that unless someone or something—quite often, the State—intervenes to set us on a better course or protect those things that they regard as sacred. This is the heart of Wu’s critique in The Master Switch: The real threat is not Big Brother but Big Corporate Brother. It’s certainly not a new critique. Wu is simply steering the Lessig-ite, cyber-collectivism school of cyberlaw in line with traditional “progressive” perspectives and recommendations. Indeed, although he and other so-called progressives don’t always come right out and say it, they often suggest that private power – however defined – is so insidious and threatening that greatly amplified State power to counter it becomes essential, even a good. The cyber-collectivist movement that Lessig began with Code and Zittrain and Wu continue in their books, is fueled by that dour, depressing “the-Net-is-about-to-die” fear. Again and again their message comes down to this: “Enjoy the good old days of the open Internet while you can, because any minute now it will be crushed and closed-off by corporate marauders!” This crowd want us to believe that the corporate big boys are — someday very soon — going to toss the proverbial “master switch,” suffocating Internet innovation and digital freedom, and making us all cyber-slaves within their commercialized walled gardens. We might think of this fear as “The Great Closing,” or the notion that, unless radical interventions are pursued — usually of a regulatory nature – a veritable Digital Dark Age of Closed Systems will soon unfold, complete with myriad AOL-like walled gardens, “sterile and tethered devices,” corporate censorship, and consumer gouging. Again, it’s really just a restatement of the old Lessig vision of an unfettered cyberspace leading to “perfect (corporate) control.” In other words, most information systems, networks and devices will be bottled up by corporate “gatekeepers” if markets aren’t steered in a better direction by wise philosopher-regulators. And these “Openness Evangelicals,” as I will call them, believe they are the sagacious chosen few who will serve as the self-appointed janissary of the supposed dying order of openness. My critique of this cyber-collectivist thinking and “Great Closing” thesis was more fully developed in these two essays [1, 2] and will be more robustly developed in a chapter for an upcoming book that will be published shortly. Much of what I’ll have to say in response to Wu’s new book will be drawn from those essays as well as my two-part exchange [1, 2] with Lessig upon the 10th anniversary of the publication of Code. Basically, I do not buy – not for one minute – the notion that “the Internet is dying” or that “openness” is evaporating. The Internet has never been more vibrant or open. Again, please read those previous essays for my completely response. I’ll be teasing out some of those themes in future essays here. Rarely is there any discussion of the nature of the respective forms of “power” or the coercive nature of State power, in particular. The fact that the State has a monopoly on force in society and, thus, can penalize or even imprison, is either ignored or treated as irrelevant compared to the supposed “power” of private actors. Rarely in their analysis — and never in Wu’s book — is there a serious cost-benefit analysis of the trade-off associated with an aggrandizement of State power in the name of countering the supposed evils of private power. The solutions offered – to the extent they rise above amorphous calls to “do something” – are presented as cost-free options. There isn’t enough focus on the dangers of “regulatory capture” or the massive inefficiencies associated with the sort of regulatory regimes that progressives and modern cyber-collectivists like Wu would substitute for market mechanisms. In my next installment, I’ll take on Wu’s critique of the fictional “purely economic laissez-faire approach” he derides – an approach that has never existed in American communications or media markets. In a forthcoming installment, I’ll also be challenging Tim to a Simon-Ehrlich wager on this front and ask him to put his money where his mouth is to see just how serious he is about his dour worldview and extreme technological pessimism! So, stay tuned. Previous post: If the Premises are Wrong, Why Read On? Next post: Should the military have a role in civilian cybersecurity?